I solved eight problems on the Putnam last Saturday. Here were the solutions I found during the exam, plus my repaired solution to B3 (the solution to B3 I submitted originally had a mistake). Some comments about the test. I thought that the A test was mostly very easy: problems A1, A3, A4 were all routine, and problem A5 is a little long-winded but nothing magical. Problem A2 was tricky, and took me well over half the A session. I don’t know anything about A6, but it seems to be very hard. Points and are on the same branch of the hyperbola . Point is selected between them maximizing the area of . Show that the area of region bounded by the hyperbola and equals the area of region bounded by the hyperbola and . Define , and . Find an odd prime dividing . Let where . Compute . Prove is odd if and only if for some prime . Let , , , be real matrices. Prove that if and , have the same characteristic polynomial then . Let be thrice differentiable. Prove that if has at least five distinct roots then has at least two distinct roots. Starting with the list of positive integers , we repeatedly remove the first three elements as well as their sum, giving a sequence of sums , , , , , and so on. Decide whether some sum in the sequence ends with in base . Define to be the set of real matrices such that , , , form an arithmetic progression in that order. Find all such that for some integer , . is rational and determine its value. does not depend on and determine its value. and so these are equal. By induction we have . Thus for any , , because their quotient is both rational and an algebraic integer. Thus . During the test, I only found this solution by computing , \dots, explicitly and factoring the first numbers, upon which I realized . We first prove that for every . It suffices to consider since otherwise . We note that for any , if and then we require that for some ; since this implies . Thus among any three consecutive numbers, at least one is in . Plainly and hence . so the answer is . Let . The solution now proceeds in three cases. If any prime is or mod , say , then for and thus is even. If all primes are or mod and , then and for and thus is even. But if and then is always odd. This completes the proof. Lots of people said something about trying to use the Intermediate Value Theorem to show that has a root between any two roots of . This would require to be continuously differentiable, so it breaks down at the last application to . I deliberately appealed to Rolle’s Theorem because I didn’t trust myself to deal with these real-analytic issues during the exam. for . These work by taking . which is not zero everywhere. Its characteristic polynomial is , with discriminant , so it has two distinct real roots; moreover, since either one of the roots is zero or they are of opposite signs. So we know and can compute so a long algebraic computation gives that these differ by . Also, I swear I’ve seen the exact condition many years ago, back when I was doing high school olympiads. But it was so long ago I don’t remember the source. 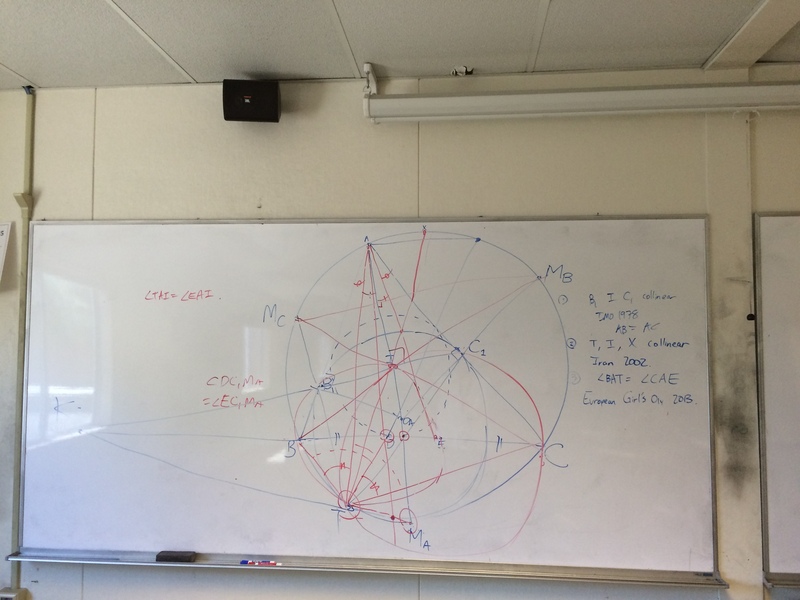 This blog post corresponds to my newest olympiad handout on mixtilinear incircles. 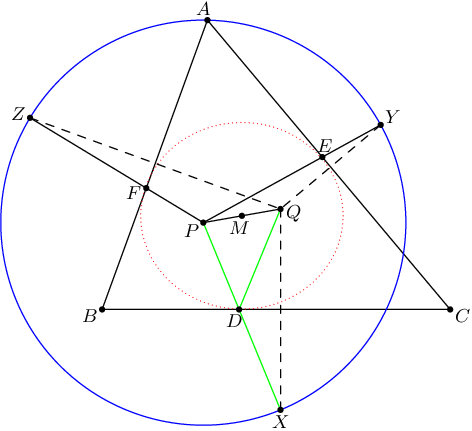 My favorite circle associated to a triangle is the -mixtilinear incircle. While it rarely shows up on olympiads, it is one of the richest configurations I have seen, with many unexpected coincidences showing up, and I would be overjoyed if they become fashionable within the coming years. 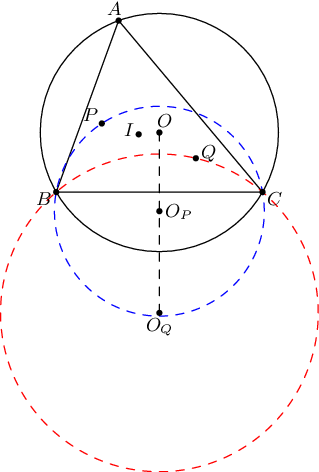 The points and are the contact points of the incircle and -excircle on the side . Points , , are the midpoints of the arcs. As a challenge to my recent USAMO class (I taught at A* Summer Camp this year), I asked them to find as many “coincidences” in the picture as I could (just to illustrate the richness of the configuration). I invite you to do the same with the picture above. The other two things that happened: one, I discovered one new property while preparing the handout, and two, a student found yet another property which I hadn’t known to be true before. In any case, I ended up covering the board in plenty of ink. Here’s the list of properties I have. 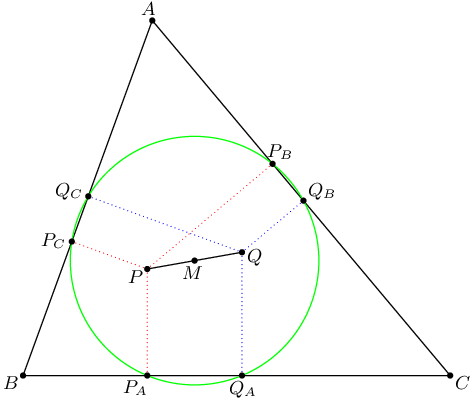 First, the classic: by Pascal’s Theorem on , we find that points , , are collinear; hence the contact chord of the -mixtilinear incircle passes through the incenter. The special case of this problem with appeared in IMO 1978. Then, by Pascal on , we discover that lines , , and are also concurrent. This also lets us establish (by angle chasing) that and are concyclic. 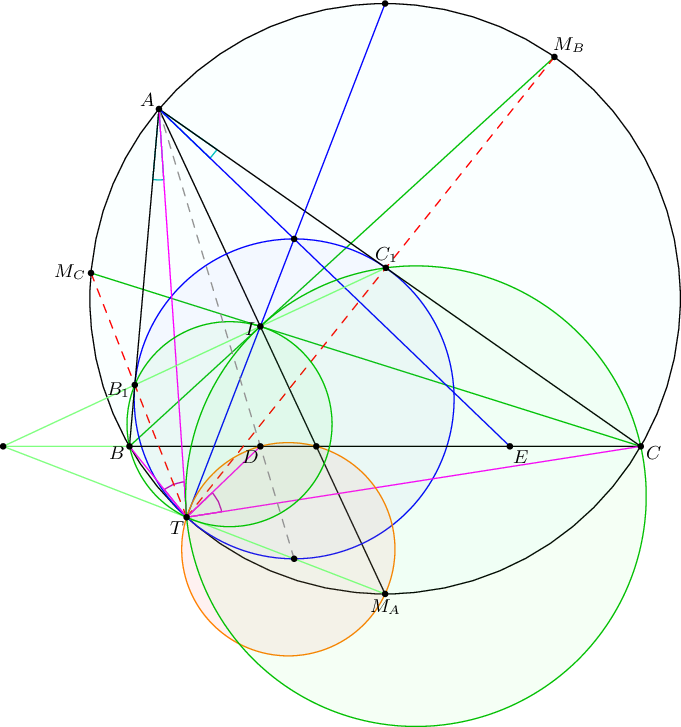 In addition, lines and are tangents to these circumcircles at (again by angle chasing). An Iran 2002 problem asks to show that ray passes through the point diametrically opposite on the circumcircle. 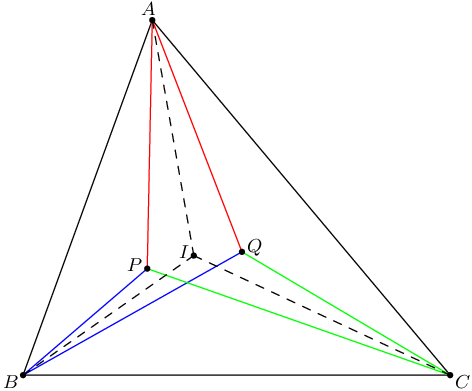 This is solved by noticing that is a symmedian of the triangle and (by the previous fact) that is a median. This is the key lemma in Taiwan TST 2014, Problem 3, which is one of my favorite problems (a nice result by Cosmin Pohoatza). Lines and are isogonal. This was essentially EGMO 2012, Problem 5, and the “morally correct” solution is to do an inversion at followed by a reflection along the -bisector (sometimes we call this a “ inversion”). As a consequence of this, one can also show that lines and are isogonal (with respect to ). One can also deduce from this that the circumcircle of passes through the intersection of and . 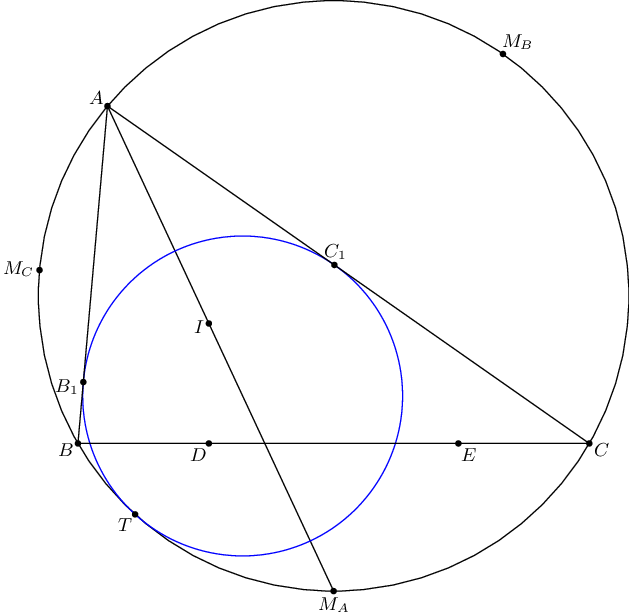 Moreover, line passes through the exsimilicenter of the incircle and circumcircle, by, say Monge d’Alembert. 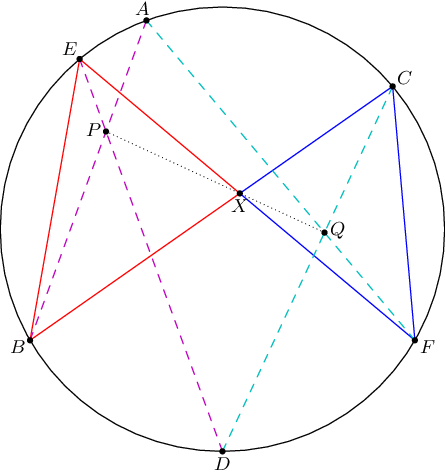 Said another way, the mentioned exsimilicenter is the isogonal conjugate of the Nagel point. I always wondered whether I could generate olympiad geometry problems by simply drawing lines and circles at random until three lines looked concurrent, four points looked concyclic, et cetera. From extensive experience you certainly get the feeling that this ought to be the case — there are tons and tons of problems out there but most of them have relatively simple statements, not involving more than a handful of points. Often I think, “I bet I could have stumbled upon this result just by drawing things at random”. So one night, I decided to join the tangency point of A-mixtilinear circle with the orthocenter of a triangle ABC. You can guess about how well that went. Nothing came up after two hours of messing around randomly. 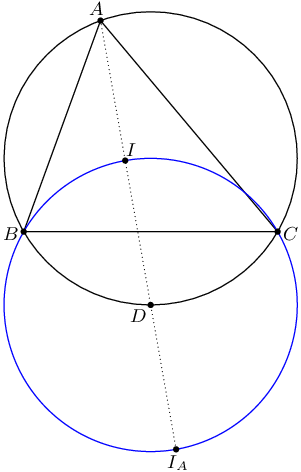 First, start with a known configuration: for example, the the incircle and A-excircle touch BC at D, E such that BD = CE. Starting with the proxy problem, start adding in new lines and circles and points until you find a conjecture. In other words, it seems like “randomly wander” doesn’t work so well, but “randomly wander starting from somewhere that already has structure” works great. I’ve tried this four times and each time has gotten me a new problem. I have to wonder what makes this work. I think it has something to do with the fact that olympiad geometry has a different structure to it than the other olympiad subjects. For example, given an arbitrary geometry problem and two contestants, it’s much more likely that they will come up with different solutions than in any other subject. This seems to suggest that, if one takes a true result and examines the diagram, there is likely other structure present within. This is a reflection of a talk I gave today. Hopefully these reflections (a) help me give better talks, and (b) help out some others. Give more depth to the explanations, e.g. trying to explain motivations behind steps. Give students substantial time to try the problems themselves. Because IMO it spoils the fun for me to just keep giving solutions. I plotted out in my head what direction the lecture would lead to. The most memorable part, I decided, would be problem #10 (by far my favorite on the set — try it! ), and so I made a note to myself to end with that one. This turned out to be a good decision. I started out by asking the students to name some properties of parallelograms. The important ones came out — parallel sides, congruent sides, and bisection of diagonals, along with some others I didn’t think of. I got a lot of people trying to answer this one. So far so good. I then asked what conditions listed above were sufficient to prove a parallelogram. Again I got the two I wanted: two sides both parallel and congruent, and the bisection of diagonals. I then explained that we were going to be using the bisection criteria a lot. I proceeded to present problem 1, asking the students for ideas, and was pleasantly surprised to end up with a solution that I hadn’t thought of. After congratulating the person who found the solution, I proceeded to present my solution, and tried to explain the idea of reflecting over midpoints to construct parallelograms. I then let the students work for about 10 minutes on #2, #3, #4. Unfortunately, this is where the lecture started turning downhill. I walked around the room to see if there were any questions and to see what the students were coming up with. To my surprise, I found that a large portion of the students (more than half) were not doing the problems I asked them to do. I usually don’t mind if a few students aren’t interested, but the number of them really surprised me. The second unpleasant surprise came when I began presenting the solution to #2. No one solved it in the 10 minutes, despite me having just told them to reflect points over midpoints (and there was only one possible reflection) — or if someone did, he/she didn’t saying anything. In retrospect I definitely should have written this on the board. Fortunately, I do coax the answer out of them by asking the right questions, but I now started to worry that the difficulty was too hard — ironic since I was initially worried about it being too easy. At this point it is 6:55 or so, and we have our 10-minute break. Herein, one student asks me for help with word problems — I tell him to chat with me after break (he never did). The other asks me if I am v_Enhance on AoPS. I guess my reputation precedes me. After the break we present monthly contest awards (guess who’s the grader?). I then give the students a substantial amount of time (20 mins or so) to work on #6, #7, #10, #11. The ones that did seem to be working seemed mostly interested in #10 (good!). However, as before, less than half the students were actually doing the problems. The others are chatting quietly or drawing in their notebooks. Again I say nothing, but at this point I am slightly discouraged. At 7:30PM I regroup and begin discussing #6. This one went very badly. The students seemed confused in general, and mostly fail to answer my questions. It is at this point I inadvertently learn that a few students do not actually know the similarity theorem for triangles (SAS~, SSS~, AA). By the time I finish, 20 minutes have passed (leaving 10 left) and the students seem tired. At this point I start with #10, which is met with some enthusiasm as quite a few students are eager to see a solution. I start by asking the students to randomly guess where to place the fourth vertex until they get it right. (There are only possible reflections, after all… :P). Nicely, the correct construction comes out on the fourth guess. :) I then proceed to explain the solution, which seems to be making much more sense. The timing works out great, and I deliver the punch line of the solution just as the lecture ends, to quite some applause. (You’ll have to see the solution to understand why!) Among the murmuring afterwards I hear lots of students saying that it was really good choice for ending. Quite a few students also thank me for the lecture afterwards (something that is actually quite rare), so it looks like these last ten minutes were more successful than anything else. The thing that surprised me the most was the drawing in notebooks. I had assumed that the BMC students would be more motivated/interested than the kids at HJH. It turned out this was not the case. In retrospect, here are perhaps a few explanations why. At a public school, the type of lecture I gave is really rare and stands out. In contrast, the BMC students regularly get good lectures on good mathematics, so it was harder for me to stand out. I didn’t have the position of authority a classroom teacher has at BMC. The HJH honors geometry students are actually very strong, as these are precisely the students that skipped a year of math. Many, if not most, are also my students in math club. In that vein, many of the HJH students already know me well, from math club or otherwise. The students who would have been the top students in Intermediate were long promoted to the Advanced group. I saw a lot of students staring at the diagrams I had provided on the page and not doing anything else. I wonder if next time I should omit diagrams from my geometry lectures, forcing the students to draw the diagrams themselves. USAMO problems seem too hard under any circumstances. Even when the phrase “this is not a very hard geometry problem” appears in the rubric, and with significant hints. I should have asked about the similarity. I kind of assumed everyone knew SSS~, SAS~, and AA. This was false. A couple more positive ones. A couple times in the lecture I would ask the students for a Greek letter to name an angle. This actually drew a lot of attention and seemed to help with keeping the students awake; I should try this more in the future. The #10 at the end really saved my lecture. So I will be thinking some more about keeping an “ace in the hole” so my talks finish on a memorable note.